no way that's happening. we know the market is no higher than $200 million total now. Do we really have any idea what the market is for him now? Supposedly the Phillies upped their offer to Machado be fore seeing Harper but how do we really know if they did or what that offer was? Do we really know of any of the offers out there as speculated by so many? Rosenthal captured the mood perfectly in this tweet. Rosenthal, as he well knows, plays that game too, though he's probably more scrupulous than Heyman or Nightengale. I'm just basing that on the reported White Sox offer which is surely at least ballpark accurate. (Nightengale and Olney have stood by their reporting, and to me the fact that Lozano was so mad about it means it was probably right, not wrong. He wants people to think Chicago offered more. Machado's agent called reports of a $175 million offer from the White Sox “inaccurate and reckless." Even if the Phillies or a mystery team have topped it they probably haven't topped it by much. So far. No way to know the total years or AAV, if anyone has made a 10 year offer the total would be much higher than $200 million. But the market is still either cheaper than expected or not even close to finished. These guys are going to wait until the week before spring training, aren't they? Congratulations baseball, you've managed to drag out free agency to match the pace of play in games. I don't even know who to point the finger at. It seems like teams haven't put serious offers on the table yet in trying to let the market come to them, while the players seem like they are trying to wait it out until the current teams bidding gets closer to a number they want. 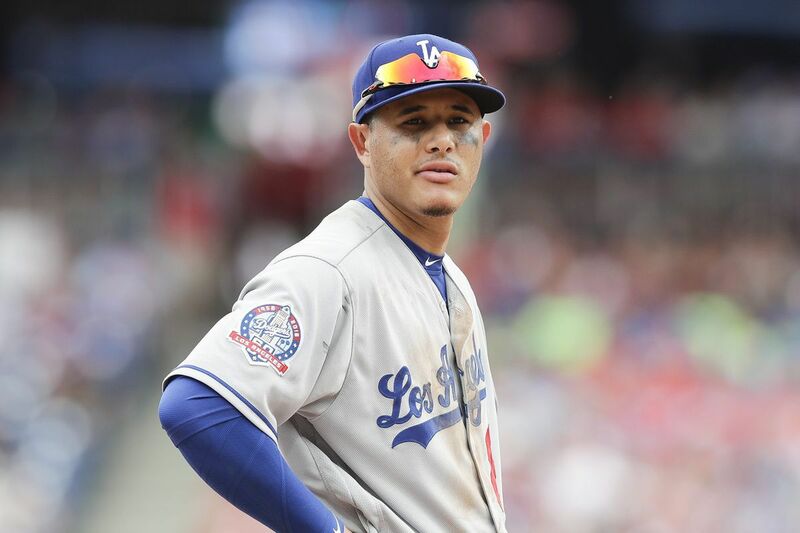 I get the feeling the the underlying current is that the Yankees and Dodgers are lying back and waiting, intentionally not bidding up the market, and waiting for Harper and Machado to decide the offers they have aren't going to get much better to go back to them and offer them the chance to beat it to sign them. The backlash from that is that the clubs currently bidding have to be leery at bidding if the players aren't serious about signing with them. All of which creates an environment where nothing happens. This is exactly how last year played out too, we just didn't care because there was no chance our team was going to sign one of the top position player free agents (though eventually the #2 pitcher did fall to us, which could happen this year too). Cain, Martinez and Hosmer all didn't sign until mid and even late February, and nothing about the free agency dynamic is different this year. Between the government shutdown and finding out if we're getting Machado/Harper I'm hating this waiting game. (Yes government shutdown is much more important). (Yes government shutdown is much more important). Bite your tongue! Nothing is more important than Phillies' baseball!! Government shutdown? A pox on both their houses (House and Senate)! As for what's truly important, I fear the Phillies have waited too long. Dodgers just signed A.J. Pollock for four years, $50 million. That's the guy we should have gotten; now we're gonna be on the hook for $300 million or so for Harper, if he deigns to sign here at all. I'm perfectly happy to get the better, much younger Harper over Pollock and also to have the Dodgers out of the game. If you wanted Pollock the move to criticize is McCutchen. McCutchen will actually play, what's the over/under that Pollock plays 100 games in more than 2 of those 4 years? Obviously that was the issue for them. Though conversely, Pollock is able to match McCutchen's WAR in 200 fewer PAs. Guessing they move Bellinger to right field. Perhaps this is a signal the Dodgers are out on Harper. I'd rather have had Pollock AND the saved $280+million rather than Harper. Pollock was the only other available free agent outfielder with at least the potential to generate significant WAR. Maybe we should inquire of the Dodgers whether they'd trade us Bellinger or Muncy. That's one crowded situation in LA - including their young phenom Verdugo. Jazhead..think you are completely wrong about Pollack and $280 million instead of Harper. Pollack would have been met with a giant yawn and in a perverse sort of way might have been faced with some disdain from a Philadelphia phandom that has almost been promised a Harper or MM. I am agnostic on the Phils chances of getting Harper or MM [one day brimming with confidence and the next day convinced it won't happen] but I have never doubted the NEED to get one of them. This season pretty much is riding on it from where I sit. And speaking of the Dodgers deep outfield, they are trying to move one of them [probably Verdugo and others] for Kluber. I still think they are even money to get Realmuto and Kluber, definitely going to get one of them. Harper doesn't seem likely to get $280 million more. But what are we saving the money for? Straight up, Harper's next five years should be worth a lot more than Pollock's next 5 years and 6 through 10 might be too. The thing I just read was that he's only played 50% of a schedule over the last three years, though obviously that is skewed by 2016. Look, if the Phililes had wanted to go sign Moustakas, Pollock, and Keuchel instead of one guy that is perfectly valid, but they have a lot of money and all three of those guys are over 30. They are cheaper because they are older and not as good. More of them is not necessarily better. The other side of it is the Dodgers are just better. They have great young position players and eight years of division titles (or whatever it is) and two World Series appearances and don't need Harper's talent or his star power nearly as much as the Phillies, who have no great young position players (just some good ones) and seven disappointing seasons and need the star power. There are certainly fans who don't like the superstars (or aren't comfortable with the $) but I don't know what kind of team you want to be watching for the next two years. And heck, the Phillies could still sign Harper and turn around and get Moustakas and Keuchel on short deals. Or get Machado and Keuchel. If they sign Harper they will likely trade Williams or Herrera. I don't know that I'd be willing to do that for Pollock. (Again, Pollock vs. McCutchen more of a debate). They're not trading Herrera and giving CF to the man of glass. Williams would be the odd man out. See, you mean Quinn but my point is Pollock can't be counted on either. Not to stay healthy, and he'll age out of CF soon enough. If you could include Herrera (instead of Williams) in a trade for Kluber or Ray I'd figure it out. Quinn, Harper, Williams and Altherr could all play CF, even if a healthy Quinn is the only true option (and Altherr might not even make the team). But Herrera probably isn't that much more attractive than Williams right now anyway. If he bounces back though, he'll look better than Pollock in two years. If they sign Harper they could easily trade Herrera instead of Williams. He might have more value and it is not like the team would not have CF options in addition to Quinn. Altherr has played CF adequately. Harper played a mediocre CF last year but that would let you get 3 good offensive bats in the OF (McCutchen, Harper, Williams) and if the team is really serious about Kingery as a super utility guy is there any reason he can't be good there with some work? Chris Taylor has played a lot of decent CF for the Dodgers the last couple of years and Kingery is probably faster than he is.